The phrase 'the fastest game on two feet' is often associated with lacrosse and nowhere is that more apt than at Under 19's level. Played on Astroturf pitches at Timperley Sports Club, the Under 19’s Autumn League is one of the most competitive in the whole of the sport. 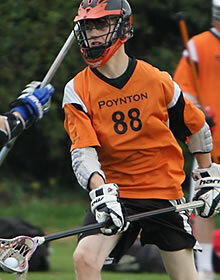 In recent years Poynton has produced some of the most successful teams in this age group. In the 2007-08 season Poynton’s Under 19’s were the first team to complete the treble winning the Ted Donnett Trophy, the Autumn League and the Under 19’s Cup. It took another 6 years before Poynton again won the treble with the class of 2013-14 A strong perormance the following year saw the U19's win the Ted Donnett and the Cup narrowly missing the league title finishing second. The last 2 years have seen a very young U19 squad finding their feet. Having won the Plate at the 2016 Ted Donnett the team went on to finish 4th in the league and reaching the semi-finals of the Plate Tournament. The 2017-18 season promises to be exciting with four strong teams competing for league and cup honours. All games are played at Timperley Sports club on the floodlit astroturf pitches. Players please arrive AT LEAST 40 MINUTES PRIOR to face off time. The U19's League will start either the 5th or 12th November - keep checking back for fixtures.